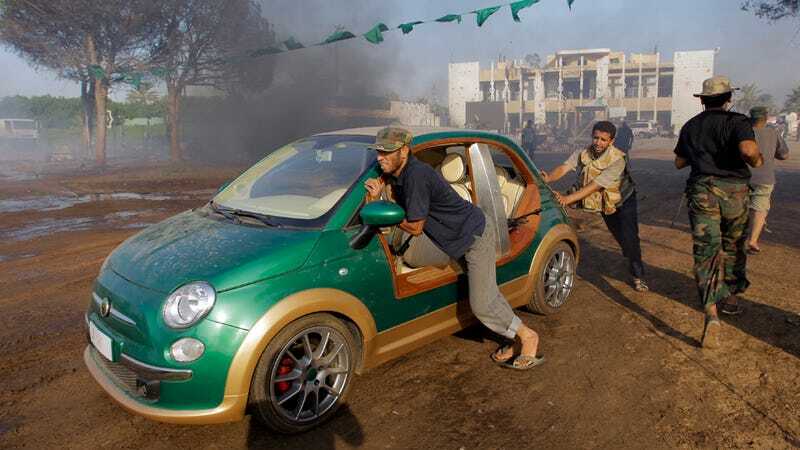 We've long been impressed by the vehicular ingenuity of the Libyan uprising, but as this photo of a dictator-approved Fiat 500 from the compound of Muammar Gaddafi shows, they weren't the only ones into customizing. UPDATE: They're pushing it because it's electric. Beyond the ground effects kit, doorless entry and what appear to be custom badges, Gaddafi's 500 looks similar to the "yacht tender" custom 500 built by Castagna, with its roof still intact. The rebels also appear to have seized Gaddafi's custom golf cart, which will be less useful as a rolling rocket launcher, along with something far more weird: his photo scrapbook of former U.S. Secretary of State Condoleezza Rice. Note to rebels: Don't put a black light on those Fiat seats. UPDATE: Turns out this wasn't just custom bodywork, but a one-off, $130,000 Fiat 500 converted by Castagna to run on electricity — except for the air conditioner, which Gaddafi needed to be gas-powered, since he was driving an open-air car in the desert. According to this Corriere Della Sera story dug up by commenters Manettino and Manik, the car was ordered from Castagna in 2009 by an intermediary — but it became clear as the car was built who it would be driven by, namely from touches such as hiding the charging port behing a badge showing Libya and an outline of Africa. The cost-no-object project stuffed enough lithium-ion batteries into the 500 to give it a range of 160 miles; special chargers could repower the batteries in 10 minutes. The rebels might lack the plug or cord necessary to get the Electo-Petro-Dictator 500 moving again, but luckily there's a few ways to recharge an electric car without an outlet.